The Galapagos Islands of Ecuador are remote. They are some 1000 kilometers (600 miles) off the South American mainland. As Charles Darwin discovered, this geographical isolation enabled Galapagos Island creatures to slowly evolve into new versions of themselves, ones that are found nowhere else on earth. Nearly all the 60,000 plus travelers who visit the Galapagos Islands take a Galapagos cruise to see the fascinating wildlife. Click best Galapagos cruise ships to learn which cruise ships rank highest. I also rank the top 5 Galapagos Islands and the top 5 wildlife. My tip pages include how to select the best boat and the best time to go to the Galapagos. I also have tip pages on cost & booking and itineraries as well as on what to pack and getting there. You'll also learn pointers on snorkeling and diving in the Galapagos. There are four of them showing strange looking creatures. Click photo gallery 1 to view the first one. I created ten pages describing the Celebrity Xpedition cruise ship in words and pictures. This section includes deck plans, cabin photos, dining, and onboard and ashore activities, and more. 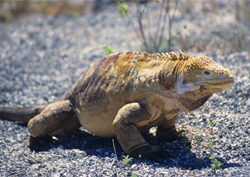 My other pages includes a brief bio on Charles Darwin and a list of interesting Galapagos facts and tidbits.